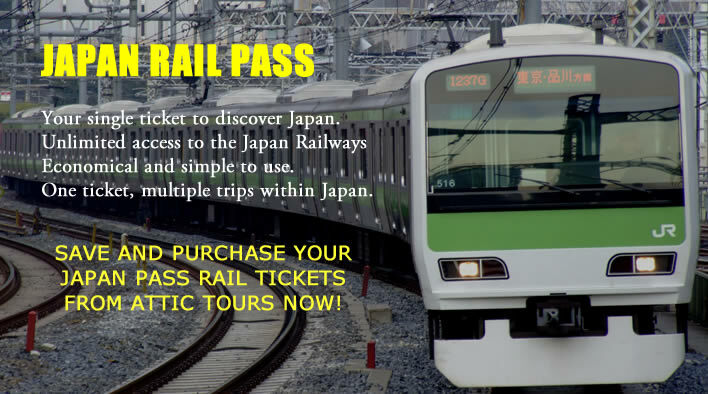 What is the "JAPAN RAIL PASS" ? JAPAN RAIL PASSoffers an incredibly economical way to travel throughout Japan by rail, including the Tokyo monorail. The pass is not valid, however, for "NOZOMI" and "MIZUHO" trains on the Tokaido, Sanyo and Kyushu Shinkansen lines. You are a foreign tourist visiting Japan from abroad for sight-seeing,under the entry status of "temporary visitor." "Temporary Visitor" entry status, according to Japanese Immigration Law, allows a stay in Japan of 15 days or 90 days for sight-seeing. Upon entry into Japan, the tourist's passport will be stamped with "Temporary Visitor." A tourist with a passport bearing this stamp can use a JAPAN RAIL PASS. a.) qualified to live permanently in that country, or? b.) married to a non-Japanese residing in a country other than Japan. Persons meeting condition a or b above must be required to show proof of same at the point of purchase of an Exchange Order and a JAPAN RAIL PASS. That they are married to a non-Japanese? Even if an applicant presents electronic data or other documentation establishing their compliance with a and b above, the Pass may be denied if the clerk is unable to verify that compliance.